This is an incredible diploma frame, made from solid Tiger Maple, which is a famous wood for making guitars with. I've dyed it a beautiful blue which only enhances the natural eye popping tiger stripes and shimmering 3-D look that runs throughout the wood. 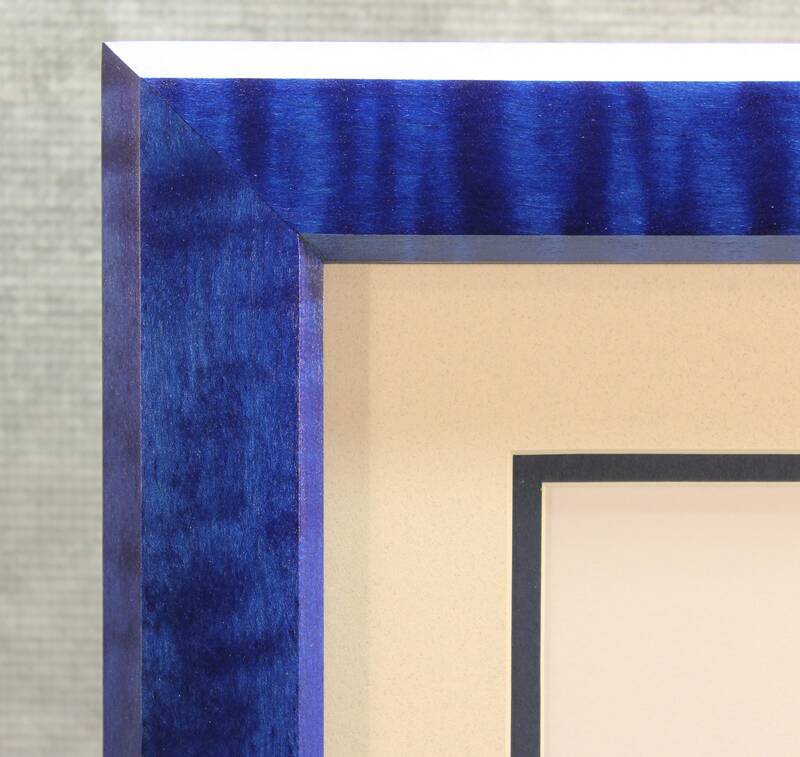 If you are looking for something other than a mass produced diploma frame and have a thing for blue - this frame is for you! This is an original, truly the only one like it in the world since it's made out solid, raw tiger maple lumber and has its own unique characteristics - not to mention the fact that it's blue! The simple, yet elegant, beveled edge that surrounds the inside and outside edge of the face of the frame gives it a very professional look and adds a feeling of authority to the diploma frame. Finish: 2 coats of blue Transtint dye, 3 coats of polyurethane oil that brings out a beautiful satin sheen. Mat: Comes with a double mat sized at 12 1/2" x 15", with a document opening 8" x 10 1/2". Any color combination of mats can be accommodated, Ivory and Newport Blue are used in this listing. Be creative with your color combinations! Check out this link to see available mat colors.